Here is page four of an eight-page article by Fred Westing entitled "The Great Days of Steam and the Glory of Pennsy Pacifics." 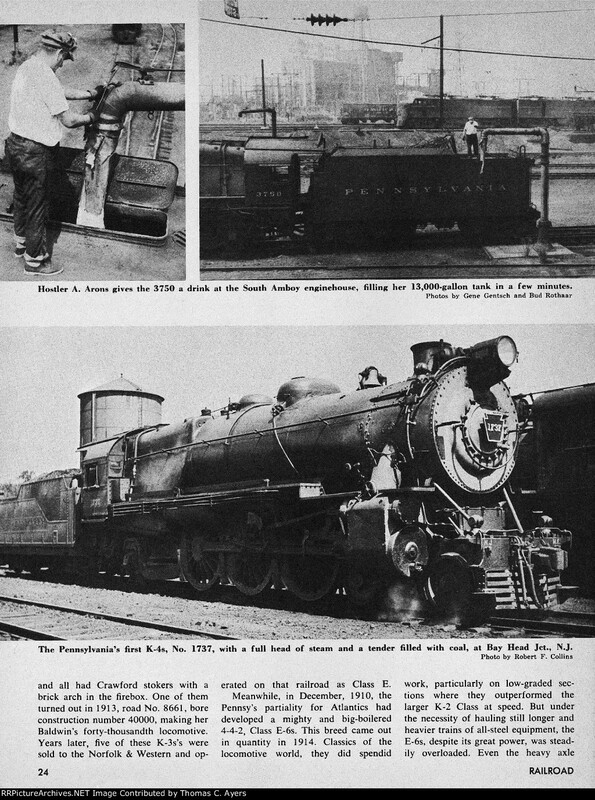 It was published originally in the March 1965 issue of "Railroad" magazine, page 24. Top Photos: Shown here is Pennsylvania Railroad engine #3750, a K-4S (4-6-2) "Pacific" built in Juniata during 1920. This locomotive has been restored and is now on exhibit at the Railroad Museum of Pennsylvania in Strasburg, Pennsylvania. Bottom Photo: Shown here is Pennsylvania Railroad engine #1737, a K-4S (4-6-2) "Pacific" built in Juniata during 1914. It is pictured at Bay Head Junction, New Jersey.